UC Cooperative Extension plays an active and ongoing role in the effort to increase agricultural sustainability and minimize the industry's environmental impact, a role that was showcased at the third Ag Innovations Conference in March. 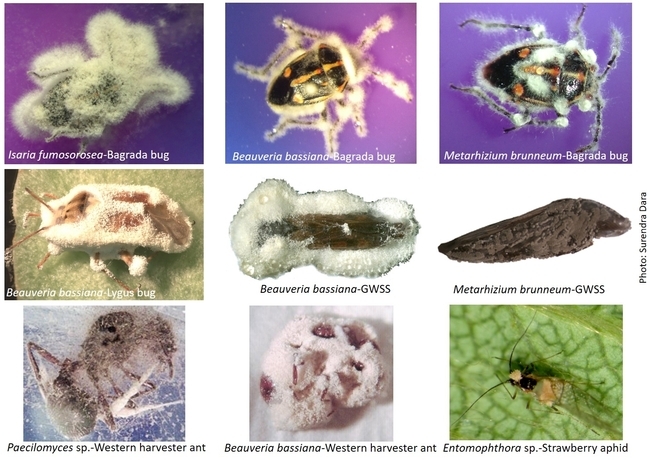 Held in Santa Maria, the event was centered on the potential for using biological solutions for the challenges faced in agricultural production – such as pest control and nutrient management. Many organic growers are already using these products successfully. 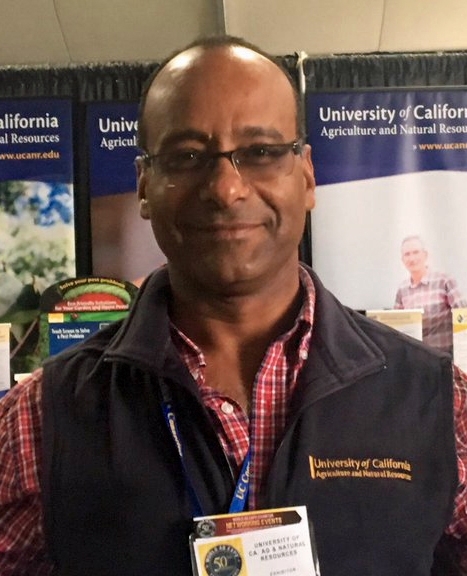 Conference organizer Surendra Dara, UCCE advisor in Santa Barbara and San Luis Obispo counties, believes increasing the use of biologicals in conventional agriculture, which represents a much larger part of the industry, holds promise for reducing the use of chemical pesticides, cutting back nitrogen inputs and sequestering carbon in healthy farmland soil. 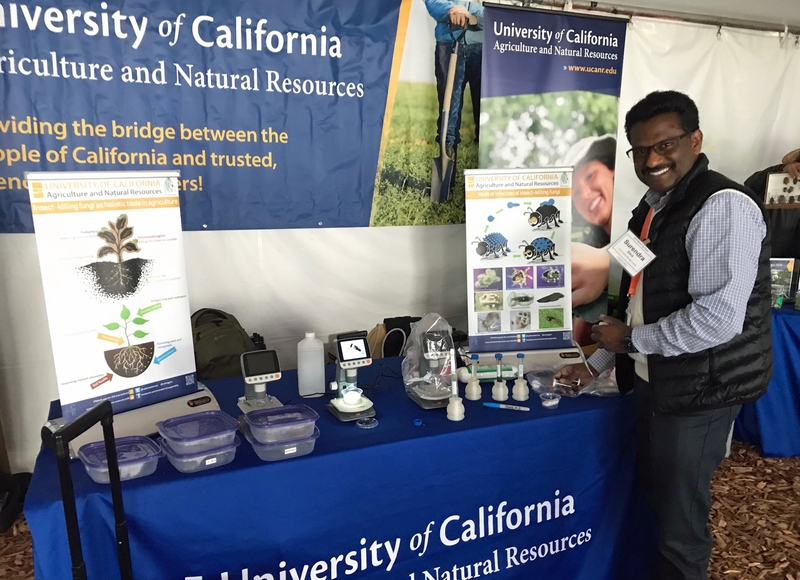 UCCE entomology and biologicals advisor Surendra Dara, shown at a display at the World Ag Expo, was the organizer of the March Ag Innovations Conference in Santa Maria. The market for biologicals in agriculture is growing. Organic farming is increasing in acreage because of consumer demand for food grown without synthetic inputs. In the conventional sector, farmers are wary of the new biological projects, probably because of past experiences with “snake oil” products that made glowing claims, but came up short. They are looking for scientific research that confirms their effectiveness. Finding funding for research in biologicals is another obstacle. Dara has conducted multiple studies demonstrating the potential of biologicals in crop production. At the March conference, he shared the results of experiments in tomato, strawberry and grape production in which he compared products containing seaweed extracts, silicon and beneficial bacteria and fungi. Research results are a key for mainstreaming biologicals in the ag industry, said Bill Schwoerer a speaker at the conference who represents Concentric Ag in San Luis Obispo, a company that produces biological optimizers for soil, seed and plant vigor. Concentric and other companies that are marketing biologicals said expectations need to be managed. Concentric's product is a unique metabolite brew that contains seven bacteria and three fungi. Ashraf El-kereamy, the former UCCE viticulture advisor in Kern County who was recently promoted to UCCE specialist at the UC Lindcove Research and Extension Center, presented results of his first year of research on seaweed extract applications on Flame seedless and Allison grape varieties in Kern County. The products are derived from wild and cultivated seaweed from oceans around the world. Their potential as agricultural inputs stem from seaweed's rapid cell division and growth, a function that is controlled by natural plant hormones. In a commercial vineyard, El-kereamy compared 11 compounds that represent most of the seaweed products on the market. The vines were treated according to label directions with at least three applications during the growing season. After the crop was harvested, El-kereamy compared berry weight, length and diameter, and found no significant differences. Sugar content, acidity and the firmness also were not impacted by the seaweed products. But in the comparison of hue angle, a measure of berry color, the research showed that most seaweed extracts prompted the grapes to increase in redness. The research results are preliminary. And more potential impacts of the seaweed products still need to be studied – such as the impact on vine growth and stress tolerance, and the impact of the compounds on grapes grown in other areas or in different varieties. But El-kereamy is encouraged by the early findings. The increased value of the redder grapes more than offsets the cost of the seaweed treatment, he said. 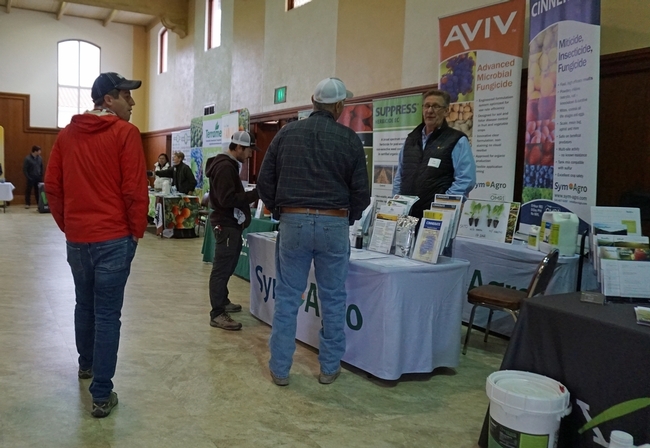 The Ag Innovations Conference in Santa Maria included a trade show. Paul Zorner, chief executive officer of Locus Agricultural Solutions, said the products made by the company target the soil microbiome and focus on high-value horticultural crops. The company has found that their probiotic supports more robust, consistent root growth by creating better nutrient status and a better microbial environment. Drew Jackson, vice president of Cool Planet, shared information about biochar, a product made by burning organic matter in an oxygen-deprived environment. He said biochar has unique properties that lend themselves healthy soil biology. “It's like luxury condos for microbes,” Zorner said. Antonin van der Lely of Biobest USA is working to move biocontrols that are used successfully in the greenhouse industry into outdoor agriculture. Katherine Walker, a technical service representative for BASF, discussed a biological fungicide from the company that can suppress root and foliar fungus. The product, called Serifel, can be used along with a chemical fungicide for added protection and resistance management. Melissa O'Neal of Marrone Bio Innovations presented information about two new Marrone products, Stargus and Ennoble. These products can also be used to alternate with conventional products to prevent resistance, she said. Stargus is a liquid fungicide that can inhibit botrytis in grapes and strawberries, sclerotinia in lettuce and downy mildew in lettuce. Ennoble is a granular bio fumigant that is incorporated into the soil, where it releases volatiles into plants' rootzones. Deb Shatley of Terramera said the company is formulating a product with cold-pressed neem oil that mixes with water in an application tank and stays in solution for days. Neem is a tree native of India and other South Asian countries that is a natural miticide, fungicide, insecticide and nematicide. The Terramera product, called Rango, provides more consistent neem spray coverage in the field.